Add a new dimension to your decorative fountain with the Aquascape LED Fountain Accent Light. This compact, round-shaped fitting retrofits almost all Aquascape fountains. The unit allows water to pass through the center of the light making for a stunning display. If you currently own an Aquascape decorative fountain that came with a plastic waterspout, this new light is completely interchangeable and can be swapped out in a few minutes. 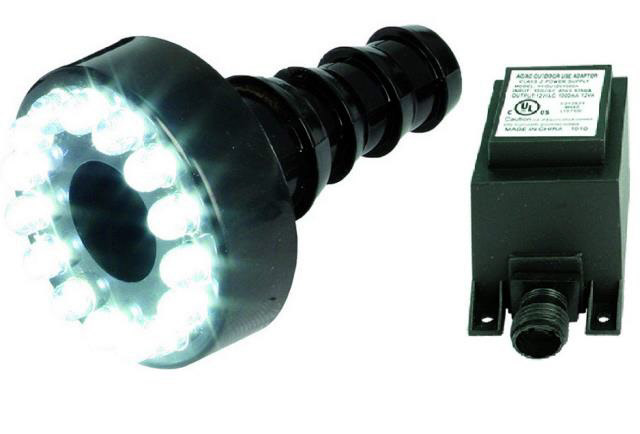 Available with 12 V Transformer (Model 84009) or without the 12V transformer (Model 84008). Transformer: Transformer is available if required (model 84009), if not select the "no transformer" option which is product number 84008. Available with or without transformer. Barbed lighting tail fits 1/2" or 3/4" hoses and holes.